As a new agent at the U.S. Fish and Wildlife Agency, Ed Newcomer is determined to make a name for himself and thus is initially disappointed when his first major assignment has to do with butterfly smuggling. Bugs? Really? He can’t be assigned to protect bald eagles or something? Quickly, though, Newcomer realizes that this could be a very major case, that Hisayoshi Koshima, the man he is investigating, is perhaps the world’s top smuggler of butterflies and might just be a target that Ed can take down. From there, the story gets increasingly strange, as Ed finds himself pulled into Yoshi’s butterfly smuggling world and works to build a case against him. Winged Obsession is a very interesting work of narrative nonfiction and a fascinating peek inside the U.S. Fish and Wildlife agency. The story seems to falter a bit early on, mostly because the writing is not initially as smooth as it might be, but Speart is a good enough storyteller that before too long her narrative takes over and the reader becomes enmeshed in Newcomer’s fight to stop Koshima’s devastating trade in butterflies while at the same time trying to hold together his marriage. Particularly interesting is the look at how the U.S. Fish and Wildlife agency operates and just how much they try to do on a tiny budget. The budgetary constraints tie the hands of the agents frequently, Newcomer had trouble even getting set up with an undercover cell phone for his operation. 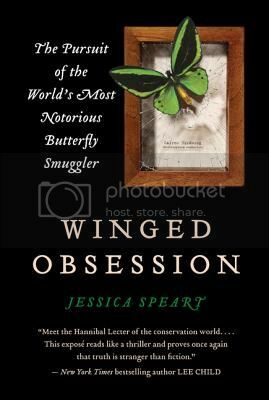 Although the writing is slightly weak initially, Speart is quickly able to draw the reader into her story of high-stakes butterfly trading. Her research was thorough, which helps bring the story vividly to life. Recommended. I met the author at an event at my indie last month. The story behind her book is quite fascinating! I bet! She inserted herself a little at the end, but it would be fascinating to hear more about how it came about. Butterfly smuggling, really? Is there big money in that? heh. I believe at one point Speart said that there its more money changing hand in the illegal butterfly/insect trade than the entire budget of the U.S. Fish and Wildlife agency. I love it when a book covers a topic I’ve never heard of before! Butterfly smuggling – who knew? I am a huge butterfly lover, and have had this book for some time now. After reading your thoughts, I think I need to get to it sooner rather than later. I read a great fictional book that dealt with some of these issues awhile ago called Currency. It’s a very interesting topic. Great review today! I love finding books about a subject I didn’t even know existed. Really, who would think there would be butterfly/insect trading let alone money to be made. I hate to admit it though, the term butterfly smuggler makes me giggle just a little. Haha you know, when I leave a butterfly house, there are always serious warnings about not leaving with any of the inhabitants. Guess there’s serious drama if you do!